after a long long bug fixing period we have declared the 0.12.20 as a stable release. Owing to the great effort of all the developers, the open bugs count at the forums is at unbelievable ... wait for it =) ... 3 items. And one of these will be solved by us dropping support for the OSX Snow Leopard. So unless there are quite a few people who have been holding the bugs reports back (out of pure mercy with us of course=)) the game should be rather stable. In another episode of the Community Spotlight I am happy to share with you news in the field of documentation / tutorials / guides for the game. A few months ago Xterminator, one of the Factorio players and Youtubers, decided to approach this challenge himself. He chose to put the information in the form of a pdf e-book. He has been in touch with us during the process of guide creation and we have provided him with a few insights and ideas. I haven't read the guide cover to cover (it has more than 100 pages), but my impression so far is that it is a very good source of knowledge especially for beginning and intermediate players. It covers pretty much all the game concepts and apart from the explanations it is full of descriptive screenshots and links to youtube / forum posts further related to given subject. The author pledged to keep the guide up-to-date and extend it as the game evolves. If you feel like you are still not quite getting what is going on in the game, then definitely give it a try. The guide can be purchased at the Factorio Strategy Guide website. One of our big promises for the upcoming 0.13 relase is improving the Multiplayer user experience. This is mainly related to discovering and joining the game. The 0.12 provides a shy (yet functional) connect dialog which will just connect you to the game based on the given IP address / hostname. What we have been working on for 0.13 is closer to what you might be accustomed to from playing other games. Python server application (called the Multiplayer Matching Server) that keeps the list of running / open multiplayer games. Factorio Server / instance hosting the game keeps the matching server up-to-date about the game information. A browse games dialog where players looking for game can see a list of all the current games. In the browse games dialog you can get the details of a particular game (description, mods, tags, players in the game, etc.) and directly join it. Filtering and searching options to look up a particular game fast. Password protection for the game to restrict who can join it. And of course the LAN discovery mode, where you can see all the local network games. The basic functionality for all the features in the above list is there already. Now we are in the process of tweaking, experimenting and (later on) polishing - as you have probably noticed this phase often takes quite some time=)) In the future we are very open to extending this futher (integration with Steam Friends, automatic mods downloads to match the game mods, etc.). 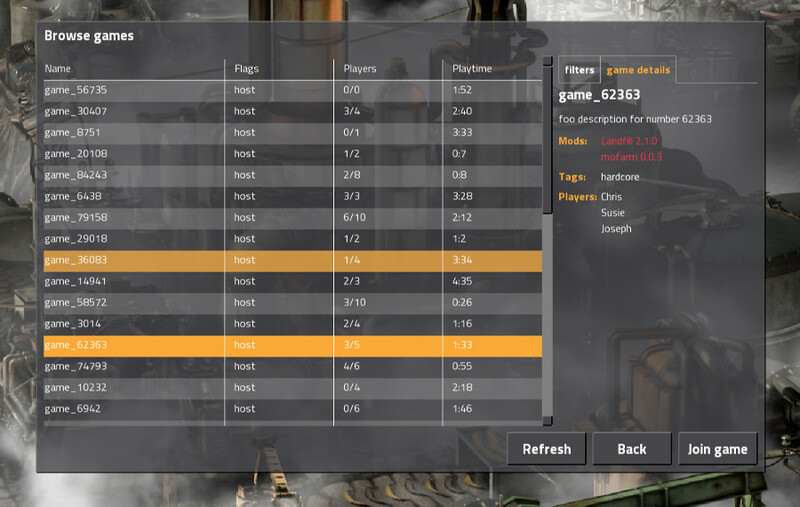 Below is the screenshot of the browse games gui filled with randomly generated testing games. If you have any thoughts regarding the topics above then let us know at our forums.